The Claremont Angkor Hotel welcomes you to experience the warm and unique Khmer hospitality you expect and exemplary service you deserve. 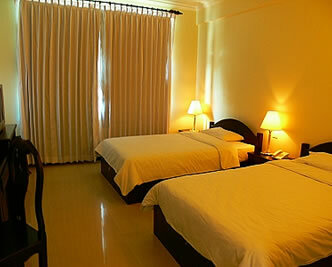 We provide all types of facilities: pool, internet, Wi-Fi, restaurant, gym. With 50 exquisitely decorated rooms, the Claremont Angkor Hotel is large enough to provide you with the full range of guest services, yet small enough to remember your name and never forget that for our guests, the only room matters is yours. Check our new prices! Borrowing from some of the finest hotels and resorts in the world, the Claremont Angkor Hotel has created a unique synthesis of international architecture, Cambodian design and some unique touches of your own, located on a quiet side of Siem Reap, Cambodia, just half a block from the towns scenic riverfront, 6 km from the famous Angkor temples walking distance to almost anywhere in Siem Reap you’d want to go. Claremont Angkor Hotel in larger map.